In my prior attempts (this was my 3rd serious one), once I’ve failed in prelims and another time I didn’t qualify the mains exam. By this time I was getting slightly disillusioned with the whole process, and once you reach the situation where you become comfortable with all the things that can go wrong with life, you become powerful and invincible in your own way. Therefore this time, with the clarity of understanding that I will not take any attempt at the exam anymore, I invested more effort, changed the strategy I was following previously (because clearly it wasn’t working), and left the rest to the universe. That paid off, and I landed a comfortable rank in the list. I am a resident of Banaras – I was born and brought up there. The only child to my parents, I like to while away my time reading novels, painting, watching TV series’ and documentaries and in general spending time with friends and family. Most of my schooling was from Rajghat Besant School (A KFI School) after which I went on to pursue Chemical Engineering from BIT Mesra and graduated in 2013. Then I worked with ACC Ltd for an year, and this is where I decided that I have to give the Civil services examination a try. I’ll be keeping the article as concise as I can. Also I won’t be listing all the basic books here, as I’m assuming you’re already aware of most of the sources that are to be referred to. If not, You can easily find the list on Mrunal’s website. 1. Not attempting all the questions – I had heard from somewhere that answering some questions beautifully fetches the same amount of marks, as answering all the questions in an average manner. I adopted this advice also as a cover for my surrender, because I write very slowly and covering all the questions on time was an incessant struggle for me. Now this strategy may work for some, but it ruined my chances at the interview in 2016. I had left almost 2 questions on average in all the GS papers. Thus, in 2017 I tried my best to finish the paper. Even though I still had to leave one question each in GS 1 and 2 as well as in Optional Paper 1, I was still more at peace than my previous attempt. 2. Having too many sources to rely on – Though preparing without coaching has its own benefits, it has a huge flipside in the form of the ambit of sources an aspirant starts consulting. We end up with notes gathered from here and there, handouts of this coaching and that, which only raises the anxiety level whenever we look at the rising pile of papers. Thus I significantly reduced my sources this year and made sure I only consult something if I can revise it later. 3. Poor structuring of answers – I wasn’t following the Introduction-body-conclusion format which I think really pulled me back. So this time, I made it a point to properly structure most of my answers in the given time frame. I had joined the ForumIAS MGP Test series, and even though I didn’t take a lot of tests (I’m lazy), Asif sir (my mentor) made me sit down with my answer sheets, specifically pointed out the mistakes and helped me structure my answers in a much better manner for which I can’t thank him enough. He also helped me optimize my time better and made sure I didn’t take any extra time while attempting the tests. and that became a good feedback mechanism especially for GS-2, GS-3, and optional papers. Highly recommend getting your answers peer-reviewed. ⇨ I also started timing my answer-writing practise to 8 minutes per question. Though I religiously didn’t follow through with this, I still think it helped. ⇨ On my best days, I would practise writing 5-6 answers everyday for at least 45-60 days prior to the exam. I had scored decently in the Essay paper in 2016 (151) and even though I didn’t specifically prepare for it, I kept reading good books/quotes to develop a spherical thought. But please note that I’ve been an avid reader of novels for as long as I can remember. At school I was always an active participant in article or essay writing competitions. Then at college I took to writing blogs as well, so while I didn’t face a lot of problems in this area, a lot of aspirants do and I would advise everyone to practice writing a few essays sincerely. I tend to dabble with philosophy out of interest so that, along with Lexicon(book), covered most topics in ethics. I also saw the videos of Michael Sandel ( Harvard fame ) on youtube which provided some clarity of thought. I made it a rule of writing one GS-4 answer per day, and put it up for review by other co-aspirants. That said, I wrote very generic answers in GS-4 this year, and my score toppled by a straight 30 marks as compared to 119 marks in 2016. So ignore ethics at your own peril. To make everything revision-friendly, The Lesser The better became my motto (I’ll be inserting pictures for better understanding). 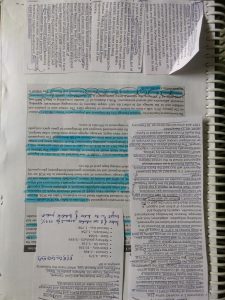 I had stopped making my own notes long back and started scribbling whatever relevant information I gathered on the margins of my previous notes or the books I had. The de-cluttering exercise really boosted my confidence. 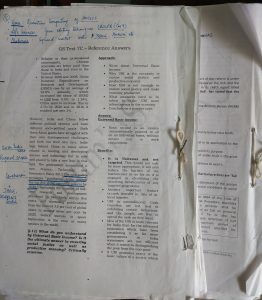 ⇨ Of the already existing notes that I had, some were in hard-copy ( Like the optional notes, Economics and Geography notes which I had basically jotted down from Mrunal’s lectures and scribbled on them anything important that I came across later ). I cut out important answers from the solution booklets of Forum and other test series, and stapled them on the pages of these notes so that everything was at one place in a form as consolidated as possible. ⇨ As far as notes in the electronic form are concerned, there were very few. Mostly I used to take screenshots of important things I found on the internet, and saved them in different folders in my phone’s gallery [under the names : Art and Culture, Environment, Polity etc] so that I could go through them anywhere I wanted. That had immensely helped in both 2016 and 2017 Preliminary, as well as in the Mains examination. ⇨ During the last month of the Mains examination when reading several newspapers became a little tougher, I kept a few current affairs highlights notes on OneNote as well, which I’d made from random websites. ⇨ Apart from that if I found any GS answer from the solution booklets(Forum or otherwise) which was important, I would keep that page and throw away the rest of the booklet. Later on I fastened all the important answers together for quick revision. Aim was always to reduce the stack of papers before me. For 2 months prior to the written examination, I started my day with newspapers (which I’d read on my laptop)..then I would study for my optional subject from morning 9am – 2pm (With breaks in between, of course). The rest of the day would be for GS. I would set topic-wise targets and dedicate two days per week each to GS1, GS2, GS3. For the remaining one day, I did not set any target in order to cover whatever topics I could not finish from the previous week. I was hardly ever on schedule because writing the tests(GS & optional) also had to be fitted-in, in the whole scheme of things. I never had a rule that I would have to study for a certain number of hours per day. My aim was always to finish the set targets, whether it took me 6 hours, 8 hours or more. I’d like to emphasize, that there is NO other alternative to practising answers regularly. You cannot afford to ignore it at any cost whatsoever. Almost two months prior to the Mains exam, I began answer-writing sincerely. I tried to write 5-6 answers per day but was perpetually struggling with time-management. I attempted to time my answers to 8 minutes but no matter what I did, It took about 10 minutes for me to write a decent answer. So this is one problem which persisted till the end, and as a result I ended up leaving one question each in both GS 1 and GS 2 papers, as well as a 20-marker in Optional Paper -1. In my head, even the Essays weren’t written satisfactorily due to want of time. Pick up a topic, say Health. Gather the basic data eg. What percentage of GDP is our health spending? How much are the other countries spending? What percentage does the 12th FYP envisage? What percentage of the population is covered under health insurance? Divide the topic under heads – General health, Women’s health, Child health, Geriatric care etc and jot down the Govt. schemes/policies specific to each head (For easy retention). Remember the names of Committees, if any. Above are best placed in the introduction / conclusion though sometimes I used them in the body as well. Consolidate the information – Say If you come across something about fat tax, also immediately scavenge the internet about obesity-related health issues eg cardiovascular diseases, prevalence of diabetes in India, government initiatives in this regard, Importance of physical activity in schools and so on and so forth. You can do that while sitting in the metro, chatting with a friend..just about anywhere..just don’t postpone it to a later date. I guess that was my own way to mindmap, even though I didn’t jot down much of anything on the paper and relied on the screenshots I took. In the Body of the answer, exercise brevity and list the problems/issues depending on the question asked. Way forward should be similar. The sentences should be short and crisp as far as possible and beating around the bush should be avoided because it gnaws away at your precious time. One mistake I used to make at the beginning was that my introductions used to be too long and therefore half-way down the answer is where my content actually started. I tried to rectify it, and kept the Introduction to a bare minimum of 2 lines, in the final examination. Most of my answers (If not all), ended with a 1 or 2 line optimistic conclusion. If I had a lot of content, I would write the answer in bullet points. If I didn’t, I would take to writing in a paragraph (Giving only two points doesn’t look appealing). I tried to underline the keywords if the time permitted me to do so. I was encouraged to draw diagrams and flowcharts, but I soon realised I wasn’t very comfortable with them & so did not include them in the final mains exam in any paper. Just revised the static portion from the sources I had prepared for Prelims from. Lexicon, Video lectures by Michael Sandel and some amount of internet-based study was more than sufficient. Just make sure you are regular with practicing questions. I did NOT read Norman Lowe, even though my friends who have scored 275+ in history papers swear by it. ⇨ Ordinary things done consistently produce extraordinary results. Therefore, REVISE what you read as many times as you can. ⇨ There is a simple realization from which all personal growth emerges, which is the acceptance of the fact that we are a 100% accountable for everything in our lives, no matter the external circumstances [ Whether we haven’t been able to finish the paper on time,or whether we reached the examination hall late etc ]. ⇨ Everyone succumbs to finitude, you will too. Don’t stop living only for the reason that you’re preparing for this exam. Pursue your hobbies, maintain good health, don’t abandon your friends and family (Especially your parents). ⇨ Just because you didn’t make it to the list this year doesn’t make you any less deserving a candidate than those who did. ⇨ You can try your best but you can’t control everything. For some it may take just one attempt,for the others it may take six tries. That’s just how the game is. 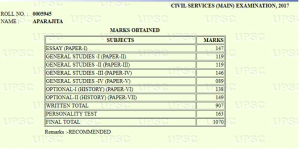 ⇨ Life doesn’t end with UPSC- CSE. Learn to look ahead.